The reunion of Deep Purple's most famous line-up (accompanied by headlines such as "it's time for all the other bands to go back to school"), was always going to struggle to match people¹s expectations. Only in one way were hopes certainly exceeded - the longevity of the event. The Mk 2 reunion lasted five years, and two decades on the latest line-up still play to large audiences around the world. Apart from the much reduced frequency of albums, there were other inevitable differences. Ritchie Blackmore had spent nine years as the central driving force of his own band Rainbow, and was never likely to accept anything but a controlling influence over the reunited Deep Purple. April 27th: Announcement of Mk 2's reformation. November 2nd : Release of first reunion studio album 'Perfect Strangers', straight in at no.5 in the UK charts. November 27th : The reunion band's first live gig, in Perth, Australia. June 22nd 1985 : Only UK date of the world tour, at the Knebworth Festival. January 1987 : Release of 'House Of Blue Light'. August 1988: Release of 'Nobody's Perfect' live album. 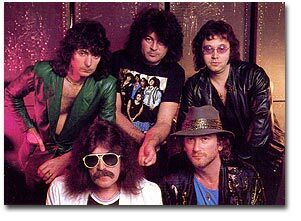 May 1989: Ian Gillan fired from Deep Purple. The first reunion studio album, 'Perfect Strangers', was released in late 1984. Generally accepted as being a good rather than great Deep Purple album, the classic sound was alive and well. The reunion euphoria helped it go platinum. The ensuing world tour, which began in Australia in November 1984, was even more eagerly awaited. Performing mostly Made In Japan era material interspersed with tracks from the new album, the 1985 American tour saw them become the biggest grossing act there that year. In contrast they played only a handful of shows in Europe, with just one in the UK (the Knebworth festival). After the tour Deep Purple began the difficult follow-up album. 'House Of Blue Light', which finally appeared in January 1987. It hit the top ten in the UK but despite a few classics, failed to build on the solid foundation of 'Perfect Strangers'. In attempting to update their sound, some of the tracks sounded overworked. The subsequent tour again relied heavily on the old 'Made In Japan' set list, with 'Perfect Strangers' tracks being the ones to make way for a selection from the new album. 1988's patchwork live album 'Nobody's Perfect' showed that the reunion was losing momentum. To relieve friction between himself and Ritchie Blackmore, and then the rest of the band, Gillan made 'Accidentally On Purpose', an eclectic joint solo album with Roger Glover in 1988. While Purple began writing and rehearsing in America, Gillan was told to stay home and instead set out on a 1989 club tour of England as 'Garth Rockett & The Moonshiners'. He then learnt he had been fired from Deep Purple. The others spent much of 1989 trying to find a vocalist, and after a great deal of difficulty, settled on Rainbow's Joe Lynn Turner late in the year. It was a decision which surprised many at the time, but in retrospect can be seen as fitting Blackmore's idea of the more melodic AOR direction followed by latter day Rainbow. Ian Gillan had soon recorded a new solo album and hit the road to promote 'Naked Thunder', which hit the shops in 1990 sometime before Deep Purple's new offering. Completing the collection.... The five cd and two dvd titles listed above cover every officially released item from Deep Purple Mk 2's 1984-89 reunion period, excepting a low quality Paris 1985 live snippet of 'Perfect Strangers' on the very poor 'Heavy Metal Pioneers' video documentary. All five promos which made up the 1987 'Video Singles' video & laser disc release are now included on the 'New, Live & Rare' DVD.